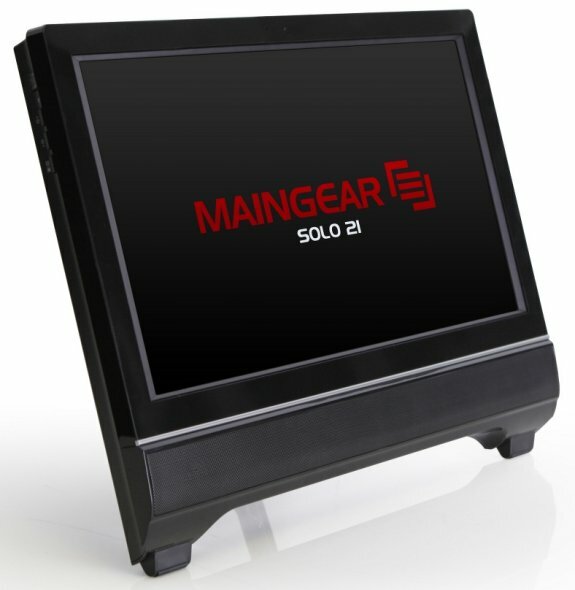 Maingear introduced the Solo 21, a new all-in-one system with the Intel DH61AG motherboard and Sandy Bridge processors. Pricing starts at $999. MAINGEAR, an award-winning custom PC builder known for custom built desktops, laptops and workstations is now adding all-in-one PC solutions to their product offerings. The MAINGEAR Solo 21 All-in-one builds upon MAINGEAR's pedigree of performance, upgradeability, no bloatware, and excellent service and support that they are known for. 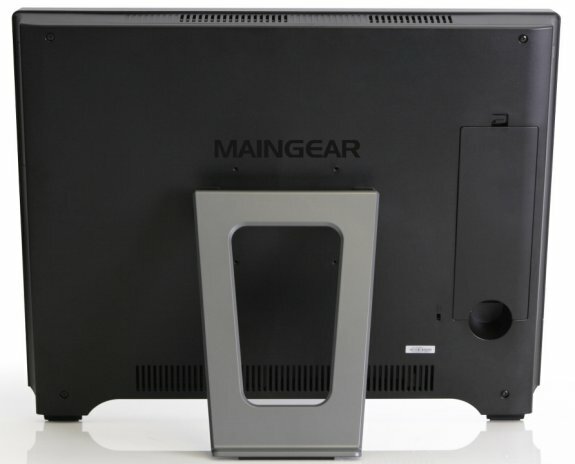 With more consumers looking for a full-size desktop computer without the hassle of wires and other connections, the MAINGEAR Solo 21 All-in-One provides the freedom of space while still offering the latest technology. Following their trend of fully customizable products, the MAINGEAR Solo 21 is the first fully upgradeable all-in-one today, including the ability to upgrade the motherboard to accommodate future technology advances. This powerful all-in-one PC features an optional vibrant LED backlit 10-point touchscreen, a built in webcam, and supports a wide range of 32 nm and 22 nm Intel Core Processor to fit your needs and budget, and comes with a 32 GB SSD caching drive for faster system response, standard. With clean lines and attractive silhouette, the MAINGEAR Solo 21 can fit in any room in the house. It can be on the living room wall as a media hub or use it in the kitchen for. With a VESA mount, you can hang it in your bedroom and use Windows Media Center to pull in content from your main PC or even plug in a digital cable tuner and use it as a stand-alone entertainment system. In world of firsts, the MAINGEAR Solo 21 All-in-One will also offer a wide range of hand-painted automotive quality colors so ahead and choose your favorite color. Since the MAINGEAR Solo 21 is completely upgradable, it features support for a wide range of processor and also supports 22 nm next generation processors. In addition, it conforms to Intel Thin Mini-ITX standards, meaning even the motherboard is upgradeable, a first in the PC industry. The MAINGEAR Solo 21 All-in-One offers up to 16 GB of DDR3 memory and supports full size hard drives up to 2 TB of storage and eSATA for fast external storage. The MAINGEAR Solo 21 is equipped with two USB 3.0 ports and two additional high current, fast-charging USB 2.0 ports to keep your mobile devices ready to go. The MAINGEAR Solo 21 also features a gorgeous LED backlit 1080p screen with optional 10-point multi-touch technology, allowing for even greater interactivity with your PC. The MAINGEAR Solo 21 is the first all-in-one to come equipped with SSD caching to accelerate the performance of your hard drive by up to 5-8X thanks to the robust Dataplex software by NVELO and a fully upgradeable mSATA slot. This unique feature gives you the performance of an SSD, without the cost or complexity of a dual-drive configuration. "We are happy to work with Maingear to enable this very unique All-in-One product," said Kevin Silver, VP of Business Development for NVELO. "They set out to deliver a flexible computing platform with reduced cost and complexity, but did not want to compromise on performance. By configuring the SOLO to include our Dataplex cache software with an mSATA cache SSD, Maingear can now offer its customers the benefit of SSD level performance, with full HDD capacity, at a minimal incremental cost." "The new MAINGEAR Solo 21 is the perfect PC to meet the increased market demand of having an all-in-one PC that is more versatile for business or entertainment use. MAINGEAR continues to be an innovation leader with the release of this unique all-new all-in-one, which offers premium features, stylish design and upgradability that no one else offers," said Wallace Santos, CEO and Founder of MAINGEAR.